I’m not completely sure how it will get them new clients, but for a company as large as State Farm, I believe this is a great new venture. The community building aspects of it alone help to boost their “like a good neighbor” marketing campaign, while the new look doesn’t make it seem like their trying too hard to do so. Besides new clients, it may even help deepen the relationship of existing clients. For example, the financial aspect of these classes may play well into the State Farm Bank and State Farm Mutual Funds products (again, not that they’d likely come with a hard sell for these). So besides new client sales as a measure of success, it would be interesting to see how many conversions of upsold clients they got from State Farm Next Door. Call it the “I didn’t know you did that too,” factor among existing State Farm insurance clients if you will. I love the idea. I want to learn those things my parents didn’t teach me about money. I’m older than the demographic but just as panicked and maybe even a bit embarrassed about my current financial planning (or lack thereof) and would embrace a place like this. I have been a State Farm customer for decades but none of my agents has ever pursued this line with me. I hope some folks at State Farm are looking at the comment of yours, Helen, because you sound exactly like the type of person they would want with Next Door. Don’t beat yourself up too much about feeling older than the demographic – it would be a mistake for ANY financial services company to assume everyone past a certain age is “with it” when it comes to their financial planning. No matter what the goal is. Considering the focus people need to have on conserving what finances they have here and now, long-term planning is only getting tougher for many of us – even though we know we have to make an effort to do it. A good reason why I think making these classes free was a smart move on their part. I would say with your situation you’re in the majority, not the minority. I like this a lot and hope it is very successful for State Farm. I would have no trouble stopping in and love the price! As a 20-something, I would find something like this VERY useful to have around – I know some basics about insurance and finances, but there is a lot more that I want (and probably need!) to know about managing my finaces. I’m looking forward to seeing what visitors think about Next Door – if it’s as useful as it sounds like it could be, hopefully we’ll see some expansion of the concept! It’s always good for a brand to have genuine internal “buy-in” prior to a new initiative, so well done on your part. I’ll say this much for it – if it’s successful in this first location, I think State Farm will have itself a nice template to follow in terms of targeting urban neighborhoods populated by 20-somethings/30-somethings who are either single, married or just had a baby. There’s a lot to be said for the “foot traffic” that happens upon a location like the one they have in Lincoln Park/Lakeview from people who are in a very transitional period of their lives. So its chances of success are definitely greater here. It could work at some point in the suburbs potentially with some adjustment (high-traffic mall settings?) but I think a beginning rollout into young neighborhoods in a city environment will help its odds of being here for the long-haul. One clarification – From what I’ve heard, the coffee won’t be free. The coffee shop will be run by an outside company. Thanks, Peter. Well, even it turns out that the java isn’t free, I’m sure many people will gladly spring for it anyway in exchange for the services provided. Yes, it is a small local business owner with a coffee shop in the neighborhood already. Also, they reused wood from buildings in the area, kept exposed brick, etc to give it a true “neighborhood” feel! I think this is great! I believe they are also allowing people to book and use conference room space for free for local meetings and bringing in outside speakers for the educational sessions. Great support the local neighborhood and existing businesses around! Thanks for the info, Jane! I’m familiar with that coffee shop (it’s about 3 minutes from my doorstep) and obviously they’ve had some nice success stories in other spaces already, which is good. Didn’t know about the conference room space made available to use – another nice touch. Hopefully next week, I’ll have some pictures to post of the interior of the Next Door space too. Today anyone needs a better exposure coupled with clarity and understanding of almost any investment that he or she would like to make, and not just insurance alone. All the more true for the younger generation and novices in finance. Only this will pave the way for a healthy, long and bonhomie customer – vendor relationship, be it any part of the country and not just Chicago. It is a matter of great honor and pride for State Farm who might very well turn out to be the precursors for a completely novel idea – a la “Superman – Friendly neighborhood” concept – not just fetching their customers delight and making them feel secure about their investments, but also infusing, acquiring and retaining trust and confidence of young and new investors in the face of vacillating global economy witnessed in the recent past. Well said, sir. In the vein of what you’re speaking about, I’m interested in seeing other examples from the financial industry that have employed a unique approach to this audience like State Farm Next Door is. I’ll go first – ING Direct’s ING Cafe. Any other cool brands that warm you up in a way you wouldn’t expect from a financial services/insurance company? Well Dan, i dont recall of having noticed any other financial services or insurance company come up with such an irresistable community focused recreational concept wherein the entire cost of all the entertainment, education and financial planning activities is just zilch. And What you gain in exchange, apart from the pleasure and knowledge in finance, is an informed and decisive way of managing your finances than you have ever done before. And by the way i did have a look at INGDIRECTCafe. To me it smacks more of just the coffee wherever my eyeballs rolled and doesnt seem to talk of anything else in particular or for that matter even in general. Maybe you would be in a better position to throw more light on that. Sounds like a “Great Right-Brain” idea. Selling more insurance by “not selling insurance”. A long slow curve that will pay off. I believe so too, Bill. Someone I respect once told me that when you are helpful and humble to the point of where it doesn’t feel like true “selling,” you get much farther. I’ve seen the benefit of that approach – sometimes when you give without expectation, it’s amazing what comes back to you. In the community Next Door is entering into where positive word-of-mouth can spread, I believe that’s a smart way for State Farm to go. 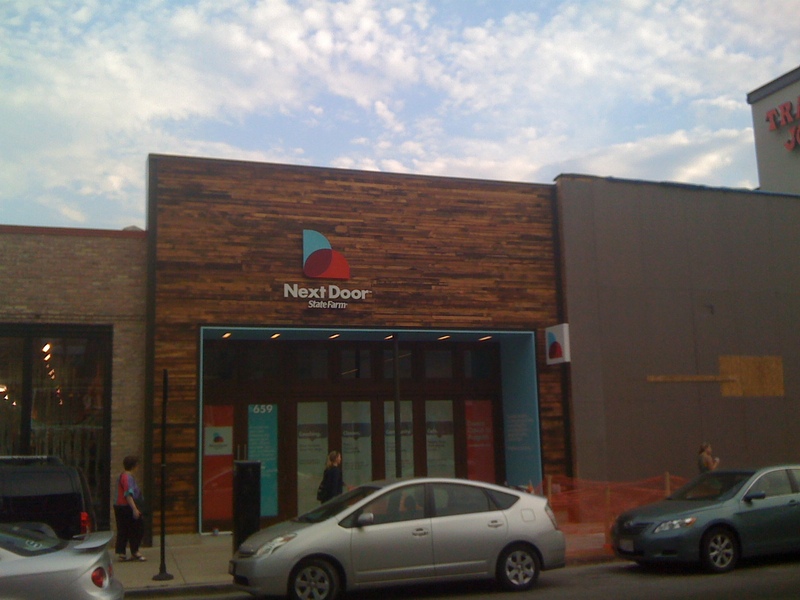 I am amazed at this concept of “Next Door” and quite honestly surprised that State Farm has come this far. I wish I’d come up with this idea of providing financial information & learning at a rock-bottom price…ZERO! As someone that works in a management role but is on the horizon of retirement; I wish there had been something like this that was readily available within our community. Yes, we are all provided with an opportunity to take the “retirement” classes but to be able to go into a comfortable setting on your own time and read and look at what you are specifically interested in, is incredible. I hope this is successful and we see it in other neighborhoods soon! I think it’s a wonderful idea. As an agent, I see individuals on a regular basis that are not planning for their financial futures. Hopefully, the “no sales” approach will go a long way towards better educating the public. Great concept. But also high risk/high reward in a sense, since sustaining this over the midterm will be very expensive for State Farm. The overhead costs, including labor and equipment, to keep this fresh and relevant will be high. At some point, every company applies a “cost vs. benefit” measurement on efforts of this nature, so there will need to be measurable increases in customer acquisition, retention, brand value, reputation, etc. that will be tricky to quantify. And how State Farm agents will respond to this new customer “touchpoint” will be key. If agents embrace it, and find ways to work with it as an ally to their efforts, rather than perceive it as a threat to their existence, will be so important for State Farm as this moves forward. Insurance and financial planning is dry, boring, intimidating, yet also so important. It’s a necessary evil in all of our lives. If State Farm can make it less scary and help educate people, it should win in the marketplace with this type of experiment. I hope it works!! Could be a long term game changer if they stick with it. As an agent I am very excited about this concept. I love going out into the community and putting on these types of workshops. I can only assume that the local agents will be a part of these services. As far as the cost is concerned I think it pales in comparison to the millions spent on TV commercials and deepens relationships, which is what State Farm is all about. As an example I am part of a group of agents that are partnering with schools and other organizations where the events do not directly market to individuals instead we are focused on giving back and creating relationships. It is about connecting with the community, the long term benefits are secondary. Glad to hear that, Josh. Just curious – as someone who has had a head start on this kind of approach with your community outreach, what have your results been with these events that aren’t “directly” marketing to individuals and focused more on relationship building? Definitely understanding where you’re coming from on the cost comparison to TV, although I wouldn’t look at those as competing directly. They both have value in building the “Good Neighbor” brand that State Farm continually strives to be. I will be interested to see what kind of tactics are used to amplify the Next Door portion of the brand – obviously right now it’s very online and social media-driven, which is a very good start in my opinion. Wonder if traditional media will have a role and if so, how much will really be needed. Sadly very few people actually have a Financial “plan”. I always said that our high schools should do a better job of educating our students regarding banking, insurance, savings, compound interest,IRA’s, tax shelters, budgets etc. As a State farm Agent of 30+ years I pray that this works and takes off so that the next generation does not make the same mistakes many of us have. Bruce, I think it’s a lack of high schools teaching those financial concepts (I certainly never had that education other than my own parents) combined with what happens when they go away to college. I can recall week after week when credit card companies would come onto our college campus, setting up shop on the way to our main cafeteria with giveaways galore if we just signed up for their card. No wonder kids get themselves into trouble in school and just after graduation. They could’ve been more responsible but they also never had the foundation or education in place for some of the things you’re describing and many took advantage of that. So State Farm Next Door, in my mind, is bringing two things to the table that more companies should want to be known for: Transparency and genuine goodwill. What a novel idea! Kudos to the fresh minds that came up with this concept! I can so visualize this working well for State Farm! The kicker will be the atmosphere and first impression neighbors will receive when they initially walk in Next Door. As a 50 something boomer, I like to feel like I’m a 30 something anyway! Wouldn’t it be nice to find a wiser, older retiree from say Merrill Lynch, or the local bank, relaxed and sitting with a Kona Blend ready to share experiences and advice?! Obviously, they would need to be relatively knowledgable and a loyal State Farm supporter with a no-strings attached attitude. Kind of like a favorite Uncle sharing financial wisdom over coffee! I would love to see this come to a neighborhood here locally or even better, to the college town where my 21 year old son is about to graduate Miss State. He might receive some insight on how to start paying those Stafford loans back to Uncle Sam! Oh, and since Hurricane Katrina, State Farm could use the positive feedback here in Mississippi…sort of damage control since State Farm no longer writes Mortgage Insurance here. As long as Next Door sells enough coffee to pay rent, I can see the concept paying off down the road. I definitely could benefit from some financial planning considering the economy and the small business loan I have hanging over my head! Thanks, Jane. I’m actually going to check out a preview of State Farm Next Door today so I’ll be able to speak more about the atmosphere even further. Excited! As I’ve mentioned, I think a city neighborhood that caters largely to people in their 20’s and 30’s is a good template for Next Door. A college town may be an option depending on how many students have the maturity to think about financial planning (some do, some don’t) vs. those who think financial planning is something you do much later on when you have kids. Either way, I see an opening for Next Door to enter, so college towns could be a future possibility if State Farm does well in the Next Door effort here.